We’ve seen some crazy smartwatch renderings recently, but we’re still holding out hope that when Apple finally releases its long-rumored iWatch it will really nail the design. If Cupertino’s final product is anything like this concept design from Stephen Olmstead we’ll be first in line to buy a smartwatch on day one. His design draws perfectly on Jony Ive’s minimalist iOS 7 design, as if Apple’s design guru created the new OS with an iWatch in mind. 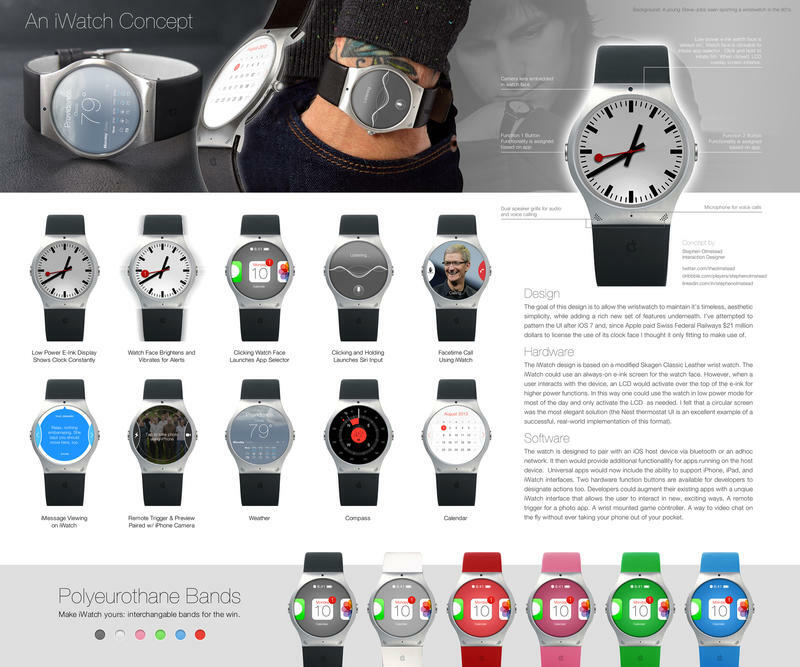 Olmstead’s iWatch design is showcased in an imagined product page, detailing the smartwatch’s many features and letting customers choose between a variety of colored wristbands. The imaginary watch itself can do a lot, and is controlled using a clickable touch display. In standby mode the watch’s digital screen displays an analog clock face, with the red second hand alerting you when a notification comes in. Click the screen once to scroll through apps or hold it down to launch Siri. You can also FaceTime, read iMessages, check the weather, and even control your iPhone camera to remotely take and preview a photo. It all sounds pretty great, but how close are we to actually getting an iWatch? Apple has hinted that it has a “very busy fall” planned with lots of new products. Considering the rumors that Samsung is preparing to unveil its own smartwatch next month, Cupertino is likely racing to bring its own model to market. However, earlier reports have indicated that the company is still recruiting a team to develop the new wearable technology, and may not launch its first smartwatch until early 2014 at the earliest.